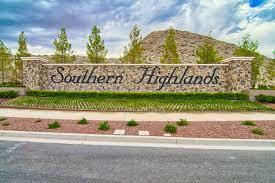 FANTASTIC SINGLE STORY, 3 BDRM/2 BATH HOME ON CORNER LOT IN DESIRABLE SOUTHERN HIGHLANDS COMMUNITY! THE KITCHEN AND GREAT ROOM ARE SPACIOUS AND BRIGHT, ALL APPLIANCES STAY WITH THE HOME. 2 CAR GARAGE WITH LOTS OF SHELVING. LARGE MASTER BEDROOM & 2ND BEDROOM HAVE LAMINATE HARDWOOD FLOORING. LOW MAINTENANCE DESERT LANDSCAPING IN BACKYARD IS PERFECT FOR ENJOYING SUMMER EVENINGS! WELCOME HOME!!! Well-maintained single story home in the heart of Southern Highlands. Spacious den which could double as a 3rd bedroom or office. Spacious, open floor plan with lots of natural light. Cozy master suite with walk-in closet. Tile flooring throughout. Perfect starter home or investment property! Enclosed backyard with patio and plenty of room for outdoor entertaining. Located in the desirable Southern Highlands master planned community, this beautiful single story, 2 bedroom, 2 bath home has a third room which can be used as a den/office or another bedroom. Nice sized master bedroom with walk-in closet and double sinks. Open, functional floor plan with natural light throughout. Huge covered patio, serene back yard, privacy, and fruit trees. 2 car garage and lots of storage. Move in ready! Built in 2001, this Las Vegas one-story home offers and a two-car garage. Community pool along with common area maintenance is part of the HOA.